Those words resonated deeply with me, because I had just been pondering the same thought. Not learning to shoot a bow and arrow, despite the influence of Katniss Everdeen and The Hunger Games; no, I’m talking about the ‘figuring out a way’ part. When it comes to writing, one of my Big Problems for many years was finishing what I started. I had no shortage of great ideas for things to write about, whether it was sci-fi epics or small, personal stories and poems. I always had twenty or thirty great concepts swirling amorphously in my head at any given time. But whenever I sat down and actually started writing, I would quickly lose traction, and before long the wheels would start spinning instead of turning. I inevitably hit the 10% barrier, which is where you fly through the first 10% of the work on pure inspiration, but then find yourself facing the remaining 90% with little but hard work in front of you. I loved to write, but I didn’t love to work. That’s just about the time when one of my other great ideas would suddenly entrance me, drawing me irresistibly to it with its sure-fire charms. I would abandon the ship I believed was foundering in favor of the new, shiny-looking one with an engine so big you think it will carry you all the way home in style and comfort, only to discover that the tank is only 1/10th full, with nothing more than a pair of oars after that. From the beginning and all throughout, I’ve been asking myself one basic question: Can I do it? Can I write this thing in my head into existence? Can I? And with each vampiristic change of hosts, the question became bigger, and the answer got farther and farther away. This was my purgatorial existence as a writer since I first sat down at my mom’s manual typewriter to write my first novel at the age of nine. And I’ve only recently begun to make progress. I know I’m making progress because I was standing in the kitchen the other night, and I suddenly realized that some small but significant shift must have taken place in me since I started the blog. At some point, without even knowing it consciously, I had stopped asking the question, ‘Can I do this?’, and was instead asking myself, ‘How am I going to do this?’ It may seem like a fairly small semantic difference, but the implications were profound. It was a warm and slightly staggering moment of epiphany. I don’t know when it happened, or how. But as I thought about the work that I’ve done over the last nine months or so, I saw that when I had what I thought was a great idea, I had been figuring out ways to write it into existence. Not perfectly, by any means, but successfully; in fact, almost always more successfully than I had anticipated. And that’s why Jeff Fabry’s words resonated so profoundly in my head about an hour or so later when I was watching the news and saw his story. 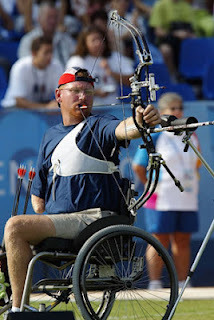 Here’s a guy who had to overcome the challenge of losing his right arm and leg in order to do something he loved. He didn’t ask, “Can I do it?” At least, he didn’t stay there. His focus settled on figuring out a way to do it. The truly important question was not whether he could; it was how he could. Asking ‘how’ not only allows for the existence of possibility; it acknowledges, it presumes, it demands it. ‘Can’ doesn’t. Changing the question changes the equation. Even more amazing is that, in all likelihood, Jeff Fabry became a better archer than he would have been had he not lost his limbs. Isn’t that crazy? 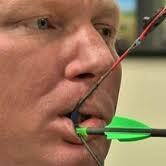 He turned himself into an archery champion, a world-class competitor. Would he have put the time and energy into attaining such a high level of mastery if he had been able to take his body for granted? How likely is it that he would have been better than he is right now if he had not had to overcome that incredible obstacle? Unfortunately, he wasn’t asked that question in the interview, but we can look at our own lives to divine the answer. The example of Jeff Fabry, and maybe in some way my own comparatively miniscule one, prove that we are all capable of tremendous change. Obstacles may stop or prevent us from achieving our goals directly, but all obstacles are finite. Our creativity, our desire to find a way, and our faith, are not. When they are fused together, they are capable of not only taking us past the obstacle, but raising us to new heights, heights we couldn’t have even imagined for ourselves before. So, think about the obstacles you face right now, the ones that are stopping you from doing something good, or maybe even great. What is it that’s stopping you? Have you mired yourself in ‘can?’ Don’t ask permission from the universe; assume you have it. Change the question to, “How am I going to do this thing?” and see what a difference it makes. You just changed my mind about law school. Thank you Thunderstrokes! That's great to hear! Please don't sue me. This is a great reminder! Very inspiring, not just your subject (Jeff Fabry) but your words. I am going to use this as an inspiration for my weight loss classes. Or to sum it up in the words of Larry the Cable Guy "Get 'er done!" Or Nike: Just do it. Good luck; I know that losing weight can be a confounding challenge for anyone.